Although I'm out of the chemistry lab, I'm still involved with teaching the subject through private tutoring and online through Northwestern's online learning program. 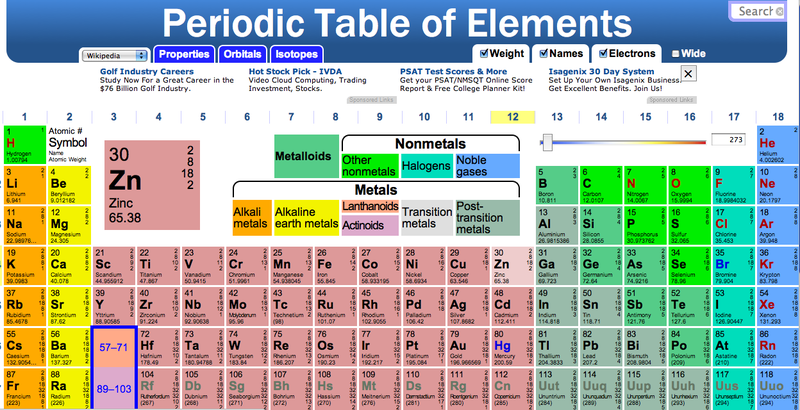 As students and teachers become increasingly attached to their computers both in and out of the classroom, they often have the need to use a periodic table online. Here are a few of the best versions that go above and beyond the traditional paper copy. They are all quick to load, stable, and would surely make Mendeleev proud. Number one on Google search for periodic tables and for good reason. 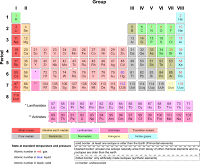 The self acclaimed "Home of the periodic table" has a ton of information and is easily a one stop shop for anything you could possibly want to know about the elements. Some of the particular categories of interest include history, compounds formed, and uses for every element. Another benefit for students is that most of the elements' essentials have been recorded, so an audio copy of the description can be heard with a simple click. 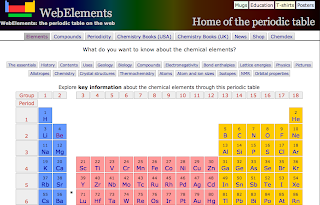 While WebElements is the place you're likely to turn to for your chemistry element research project, the site loses points for not having key information like chemical name and atomic mass at the ready (without 1-2 clicks). Thus, for a quick reference periodic table, I recommend ptable.com. Featuring a wide, bright, and colorful display, this periodic table has the symbol, name, atomic number and atomic mass all visible on the front page. Hovering over an element gives you a zoom view of the element, and clicking on the element opens a pop-up window showing the Wikipedia entry. Fast and reliable, this site is often my go-to for a periodic table online. It should suffice for all of those pesky stoichiometry problems. For the visual learner, and those looking for a connection between chemistry and real life, The Photographic Periodic Table offers multiple pictures of every element on the table. Hovering over the element brings up the key data points, and clicking on the element takes you to the element's page where more samples, uses, prices and photos are all on display. If you're a fan of the Apple iPad's The Elements app, you'll surely recognize and appreciate the work of Theodore Gray and the folks at Element Collection here. All the better - it won't cost you $13.99 to browse this stunning site. 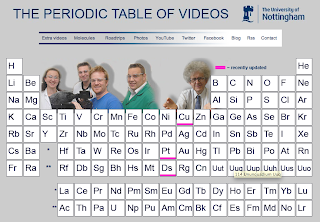 Also for the visual learner, PeriodicVideos has logged a YouTube video for all 118 elements and is dedicated to adding and improving their selection. Although the periodic table on the website itself is nothing to write home about, its purpose is really just a holding pen for all of the wonderful video resources. 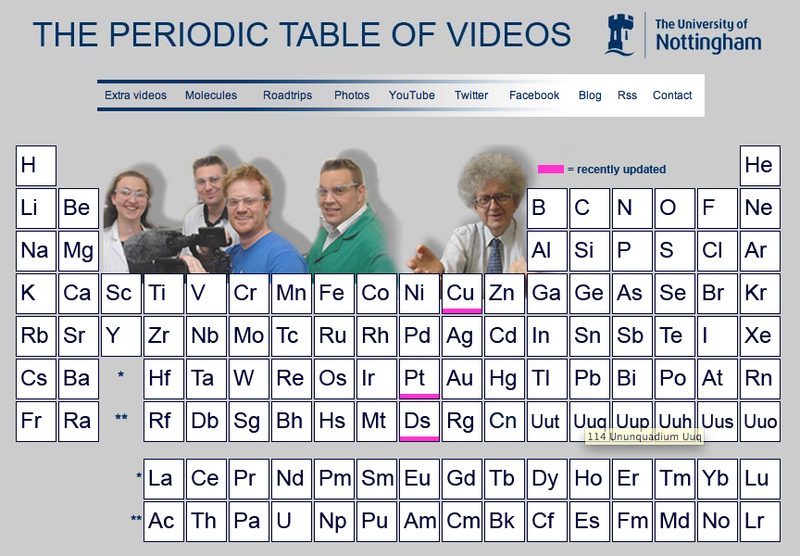 Aside from describing the 118 elements, the site also features general chemistry and physics videos, and students and teachers alike can get lost (in a good way) in all of the available content. There are over 55 website tables listed here, though I tried to make it easier by picking out the above. Still, it may be worth taking a look in case you're looking for something more specific.